Great for: London travel inspo, lifestyle, new puppy. I couldn't pinpoint when this happened, but at some point this year Sam and I both got really into Lily's channel, and we've somehow made 'a thing' of sitting down to watch her vlogs together (Sam's interest in vlogging doesn't stretch quite enough to cope with ten minute beauty videos). Now that Vlogmas has swung around, we get a new video to watch every day. At the moment, Lily and Rich have just moved into a new flat and so we're enjoying living vicariously through them and their cool London-based lives. Sam has been away for a few days and I wasn't allowed to watch her videos without him, and so now he's back we binge-watched about an hour of vlogs. Loving life. Link. Great for: Lifestyle & Interior inspo, reality bites. If you have liked/pinned/favourited a beautifully photographed home space in recent months, there's a 99% chance that it was probably something to do with Kate. It's like her Glasgow flat is a huge glittery planet, and the gravitational pull has created an orbit of well-styled beauty products and pretty vintage furniture like some kind of space magpie magnetism (I cannot get this imagery to make any more sense). Every single time I watch another video I wind up mentally cataloging ten new things I want. This list includes, but is not limited to: gold cutlery, Aesop hand soap, white grout, herringbone tiling, Lush hair treatments... The list goes on, guys. I don't even have a house, but she makes me want grout. Highlights include: Kate wrapping up in essentially all her clothes at once because she wanted a Lush bath bomb but it was essentially a hurricane outside (been there). Also, when her cat ate nearly a whole box of treats and hid the mangled evidence behind the sofa (been there too). Link. Great for: Laughing out loud, slight madness, fitness inspo (not relevant to my life). Great for: "The best way to spread christmas cheer, is singing loud for all to hear!" aka Full Throttle Xmas Vibes. If you haven't done your Christmas shopping yet, or bought a tree, had mulled wine, or basically done whatever it is that gets you feeling Christmassy-- don't bother. Don't waste your money. Just watch Zoe's Vlogmas. There is could not be a more festive place on the internet than her youtube channel right now. An average Vlogmas day for Zoe usually goes like this: Wake up in Christmas PJs, have Christmas flavour tea (i.e. marshmallow, peppermint, mixed spice) in Santa Claus mug (it has a hat), film festive video in special Christmas bedroom (decorated since mid November), watch Christmas movie in perfectly decorated Christmas lounge (festive snacks within arms reach at all times), have Christmas bath with festive candle lit in every room, go to sleep in another pair of Christmas pyjamas, dream of Christmas trees (probably). Also, own three Christmas trees and be within a ten foot radius of a reindeer at all times where possible (probably). And I'm not even hating. I absolutely bloody love it. Her love for Christmas is out of control but I am addicted. Highlights include: The sheer volume of Christmas cheer. Also: Joe Sugg smashed at the Gleam Christmas party talking about chivalry and sandwiches. Link. Great for: A breath of fresh air, watercolour depictions of things you will want to eat. Holly is a youtuber/blogger that I only just discovered in the nick of time. I think I subscribed to her channel and Bloglovin page maybe three days before she uploaded her first Vlogmas, and I can't imagine catching up on this year's videos without hers in the bunch. 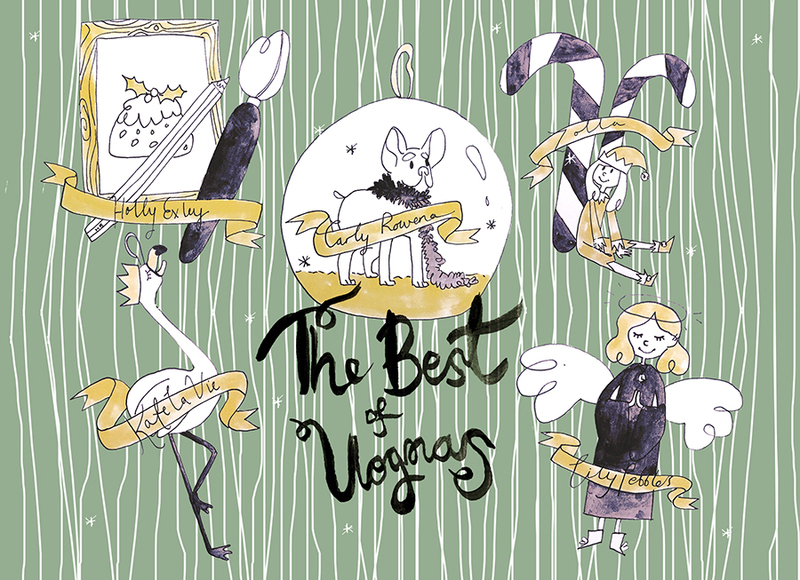 Holly is an illustrator, recently relocated to Bristol, and this year is her first Vlogmas. Something about Holly's videos just makes them a bit different to everybody else's. It's not because she's 'new', because she has a channel full of videos under her belt, but something about the way she shoots and edits just seems a bit more home grown and sweet. She usually documents the illustrations she's working on, daily life with her pug Quentin, and the various things she gets up to. Next to Vlogmas titans like Zoella, her videos are usually shorter, more subdued (like a hot bath after a long winter walk) and with the real sense that you've been invited into someone's home. Highlights include: any time she whips out a brush and watercolours. Her sheep paintings for a wool company are my favourites. Link. Anyway, I'm about three days behind now and have around thirty videos to catch up on, so I'm going to do my very best to get through them all while I'm at home feeling poorly (today's flu update: sneezes have turned to coughs, ribs very sore). I hope you enjoy having a look at some new vloggers and that they get you in the Christmas mood! Surprised that Fredcemeber didn't get a nod from you this year! I am loving Zoella's insane Christmas addiction this year. Feeling very festive. Missing you, buddy. Let our luck continue this year!